Merry Sheemas everyone, it's the last day of the CCSF! Before I dive into the contest winners, I want to thank everyone who send in a submission or entered the contests (releases and contests are the heart of a CCSF, after all)! A special thanks goes to Mea for sending in so many creature packs, and past coordinators for all of their advice for planning out the CCSF! Speaking of planning though, look out for a CCSF 2014 survey around or after Christmas. It's purpose is to collect everyone's honest opinion on how they felt about it, and to also help next year's coordinator learn from this past CCSF. The contest winners were, C1anddsaddict, Kezune and Mea. Congratulations to the winners! Who won what contest is located above today's release links, and I'll also be talking about a few of the contests here. The contests with only one entry (the Best Agent Idea, Creatchi Fur Pattern, and the Grendel Beauty Pagent), were easily decided since they only had one entry. The Metaroom Decoration Contest winner, as voted on by the community, was C1anddsaddict and it certainly fit the Sheemas spirit! The last contest, the Creature Breed Evolution one, was won due to Mea's slightly more interesting backstory, and also for being easier to make in C3/DS. Though both were interesting enough that I think I'll try make Allekha's Ettins after I'm done with Mea's. Two contests are still open, Grendel Man's genetic breed contest and Ron's trivia contest. Ron's trivia answers are due tomorrow, so that everyone has a fair shot at answering today's question. Here's the last of CCSF 2014's releases! First up is the last of Mea's Plum Feral packs! Second is another pack of time-traveling Norns from me. Then there's a pack of Grendels that were created by Grendel Man for today's big release! 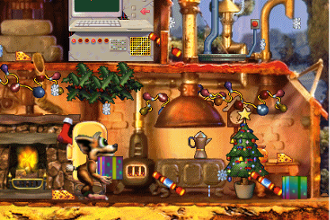 Next to last, there's a very unique toy patch plant called Jingle Balls from Laura and Ghosthande! It's a festive little patch plant that's sure to delight your creatures. Last, and perhaps most exciting, is a metaroom called Artemia Sea from Grendel Man and Mea! It's a gorgeous metaroom that has to been seen to be believed! and Some Ettins from Old Albia!" Ron has been helping some Shee decorate their ships today. While on board, he heard all sorts of tales of mystery and woe from the Shees, but one stood out for him. There was a legend of a seamonster who would help Norn fishers by herding in the Zander fish for them. In return they shared a part of their catch with him. He was so wrapped up in their tale that he stubbed his toe! So his last question for CCSF 2014 is: Was there ever a sea monster in Creatures? (Answers for all of the questions should be submitted by tomorrow. If you get them all right, then you get to take Ron home! He's a lovely C1 Norn baby). The last of Mea's Plum run! Another pack of time-traveling Norns from 2011 from KittyTikara! A pack of special Grendels from Grendel Man! A very fun patch plant called Jingle Balls from Laura and Ghosthande! Finally Artemia Sea, a gorgeous underwater metaroom from Grendel Man and Mea! Contest update time! Contests closed yesterday, and you can view the entries here. 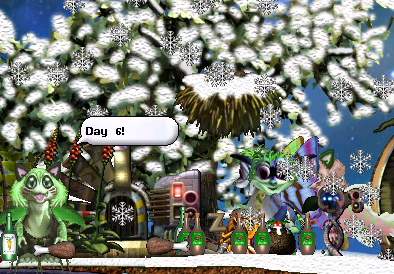 Only one of the contests that could be voted on, the Metaroom Decoration Contest, has enough entries to vote on. It can be voted on here! Voting ends late tommorow. The other contest that had more then on entry, the Breed Evolution one will be decided by me, and the winner for that will likely be announced tomorrow. 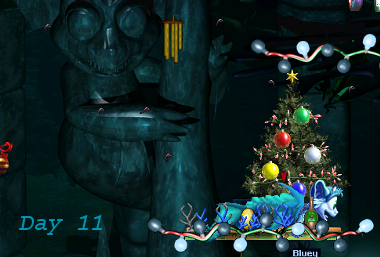 Before I get to today's releases, there's a new Festive Alpha Run that started today. It's open to submissions until Sunday! Today's releases are either creatures, or things written about them! There's the second pack of creatures from Mea's Plum Runs. They are Grendels this time, and they faired better then her first plum pack! The second pack of creatures for today is from me. It's a pack of creatures from 2009 that I found! The next release is a pack of wooden toys from Allekha. There's sure to be a new favorite toy for your creatures among them! Then there's the last part to the Handish Wonderings, also by Allekha! The last release for the day is a Veridia Metaroom Showcase from me! Ron doesn't know what Grendels evolved from. He thinks they came from some desert animal, but he isn't to sure which one it was. So his question of the day is: What Desert Terrarium animal is the supposed ancestor to the Grendel? The second Plum Run from Mea! A pack of time-traveling Norns from 2009 from KittyTikara! A pack of wooden toys from Allekha! The last part of the Handish Wonderings by Allekha! A Veridia Metaroom Showcase by KittyTikara! It's a really nice week to be a Creatures fan, isn't it? Not only is the CCSF running, but there's a wonderful community event going on. To make things even better, there's even an official livestream of Creatures Online that starts tomorrow! Check out those links for more info. Also, the contest deadline is today. Since most contests have only received 1 entry, the deadline has been pushed until 11 PM CST. Voting will start tomorrow, and end on December 12th. If there aren't any entries for that particular contest, then it will be closed. If only one person has entered, then they are obviously the winner. Ron's trivia contest will continue to run for another two days. The prize for completing all of his daily questions correctly is taking him home with you! He's a baby Ron Norn from C1, and around generation 5. Today's releases are all about Norns! First up is the last random group from Mea. She also has the first pack of creatures from when she was testing out her very colorful plums! The third release is a very catchy Creatures Village Medley from Layla. It's quite catchy! Then there's a Norngarden Metaroom Showcase by OctoberFlash! Lastly, there's a pack of generation 400 Norns from me! Ron knows the answer to today's question, though he wishes he didn't. He finds hoppities very creepy, and wishes they would leave his carrots alone. Anyway, his question for the day is: The hoppity is the forerunner to what creature? The last of Mea's random creature packs! A group of creatures raised on plums from Mea! A Wonderful Creatures Village Piano Medley by Layla! A Norngarden Metaroom Showcase by Octoberflash! A pack of gen 400 Norns from KittyTikara! Quick reminder, the deadline for the contests is tomorrow! I've actually had some luck with Toxic Norns in the past. The first time I had any success with them was raising them in the Crypt with those toxic quirky cookies. They lived a long time and actually had a few babies, who I think died early on. My latest success with them is raising a few Toxic Mermaids, which are one of today's releases in fact. Speaking of today's releases, it's a slightly toxic-themes day. There's two more random packs from Mea! There's also small group of Toxic Mermaids from me. They're basically normal Toxic Norns, except they can swim and they're based on Malkin's Toxic genome! 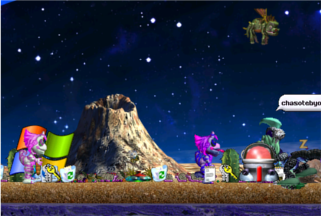 The fourth release, and what gave today it's theme, is Kezune's Garbage Dump Metaroom Showcase! Then there's her and Mea's Shelf Mushrooms. They grow perfectly on your trees, and there's even a mushroom for Toxic Norns! Last, and perhaps most cutest, is Mea's picture called "Run Away!" Ron wants to impress a Toxic Norn with how much he knows about Toxic Norns, but he can't remember the name of an agent that comes with the Toxic Norn pack. So his question is: What is one of those bouncing bugs from the Toxic Norn breed pack called? Two different packs of random creatures from Mea! A picture called "Run Away" by Mea! The Garbage Dump Showcase by Kezune! The Garden Box Shelf Mushrooms by Kezune! A pack of Toxic Norns from KittyTikara! The Biodome, Veridia, and The Freedom room are all the most customizable metarooms, at least in my opinion. The Biodome has customizable backgrounds, which never ceases to amaze me. Veridia has enough spots for patch plants, that you can make all sorts of things grow in it. The Freedom room has it's own masonry kit which can be used in all sorts of ways. All of them have their downsides, like Veridia's broken elevators, or the Freedom Room's slightly boring background, but they are all really solid rooms. Put all three of them together and you get an amazingly customizable world! Today's releases are both useful and informative! First there's two grab bags of creatures from Mea. They are randomly chosen from her Feral Runs, so you're sure to find a few creatures you like! The next release is a Biodome Metaroom Showcase by Nutter. It's an interesting read, especially if you like the Biodome! The last release is the Grettin Switch by Kezune! It lets you turn off interaction with Grendels, Ettins and even Geats! Ron is interested in swimming, but he wants to make sure there are friendly Norns underwater, not mean ones. He knows the Mermaid Norns are usually nice, so his question of the day is: Was there an Aquatic Norn for Creatures 1 or 2? One pack of random creatures from Mea! Plus another pack of random creatures from Mea! The Biodome Metaroom Showcase by Nutter! The Grettin Toggle from Kezune! Stingers and mushrooms are an underrated food source for creatures, if today's release are anything to go by. Stingers are crunchy, nuritious, and also slightly poisonous. As long as your immune to Ged and Heavy Metals, what's not to love? Mushrooms are probably the safer bet though. Most of those aren't poisonous, and some are very nutritious. Though today's Ettins might disagree, the Pizza Dough Mushrooms are probably better for most creatures then stingers. Today's releases are all about mushrooms or Creature packs! First is the last of Mea's 8th Feral Run, and another random selection of creatures. The Second release is the second part of the Handish Wonderings by Allekha. This part is about a Hand wondering where Norns go when they are exported. The third release are the Pizza Dough mushrooms by Kezune and Mea. 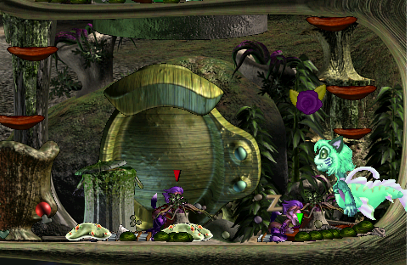 The last release is also by Kezune, and it's the Stinger Chameleon Ettins. Much like the Standard Chameleon Ettins, these guys love to eat bugs, except the Stinger Chameleons can also eat stingers. The last pack from Mea's 8th Feral Run! A random assortment of creatures from Mea! The Pizza Dough Mushrooms from Kezune and Mea! The Stinger Chameleon Ettins from Kezune! The deadline for contest entries is December 10th, which is fast approaching! Only one person has entered the contests so far, besides the trivia contest. Ron's daily trivia question, which is actually a contest of sorts, will be continuing throughout the rest of the CCSF. 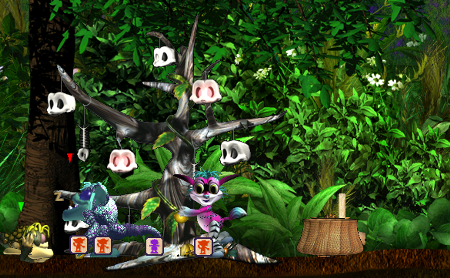 Between the nice music, and adorable Norns, Creatures 2 is one of the prettier Creatures games. The world is perhaps the best out of any of the Creatures games. Like C1, the Norns in the game are also much more lively then C3/DS. As much as I love it, I don't love it's bugs and it's the most glitchy game out of the main three. I've had more trouble with Docking Station glitching out in the past, but C2 has ended more worlds with it's glitches then DS. Despite the glitches, C2 is still one of my favorite Creatures games. Why only have one or the other, when you can have C2toDS though? It's the best of both worlds. Today's releases are all about Norns and Grendels! There's a pack of Grendels and Norns from Mea. She's also drawn a hiding Grendel for the CCSF. Then there's her C2toDS Showcase, telling us why C2toDS is one of her favorite metarooms. There's also a pack of Silver Desert Norns from me. Ron knows that one of his ancestors was the first Norn in Creatures 1, but today's theme got him wondering: What was the first Norn in Creatures 2? A pack of Grendels from Mea's techno run! A pack of Norns from Mea's techno run! A Grendelish coloring page from Mea! The C2toDS Metaroom Showcase by Mea! A pack of Silver Desert Norns from KittyTikara! The holiday sprit of Sheemas is strong this year! 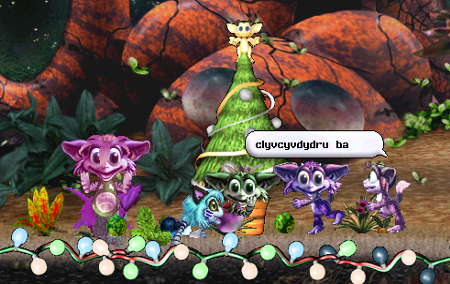 Ylukyun and Mea have started a new community project, Bibble Baubles! 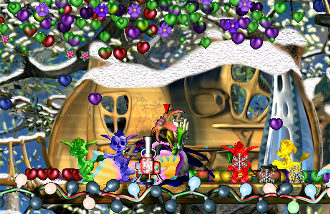 It's a Christmas inspired patch plant were you get to help design the decorations, much like the Eggstravaganza one from earlier this year. Check out their news post here for more details. Today's releases are perfect for people who love Ettins or neat dispensers! First there's two packs of Creatures from Mea's sixth Feral Run. 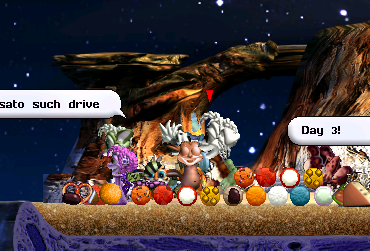 Both of them were raised around the techno-organic carrots, but one run failed while another survived! The next is an interesting dispenser from Ylukyun, the Windows XP Vendor! I can't get enough of sounds it makes, it reminds me of my old XP machine. The last release is the Standard Chamleon Ettins from Kezune! 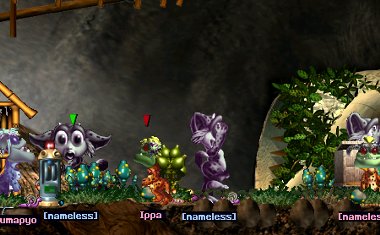 These colorful Ettins are a colortrue version of the old Chameleon Ettins by Norngirl. The colorful Chameleon Ettins are related to Ron's question of the day: Why did the Shee create Ettins? One pack who survived a nearly fatal run from Mea! Another pack who seemingly thrived in the same fatal run! A wonderful Windows XP Vendor from Ylukyun! A colorful and cute Chameleon Ettin breed from Kezune! Today's news post might be a bit short, but there certainly isn't a shortage of releases! 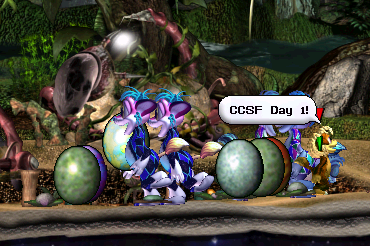 As you probably already know, day 7 usually marks the half-way point for a normal CCSF. Not for CCSF 2014 though! Thanks to the downtime, and the "12 Days of Sheemas" song, there's a whole extra day! Today's releases can help us celebrate this not-halfway day celebration. Between the new Bouncing Plums from Mea and Laura, and the Creatchitrue Norns from Ylukyun, it's sure to be a popular party! Not to mention Mea also has two packs of Creatures. Just be sure to watch your pet grazers, they might be carnivorous! Last, but certainly not least, there's an adorable Siamese drawing by Magpie-angel! The start of Mea's six run for the CCSF! An extra pack from Mea's sixth run! A cute picture of a Siamese Norn by Magpie-Angel! A pack of colorful Bouncing Plums from Mea and Laura! The Creatchitrue Norns by Ylukyun! The music in the Creatures games has always been sort of forgettable for me. I don't really remember the music from C1 or C3, though I do like the music when I'm playing them. The music in Docking Station is either terrible or okay. The hub music sounds like whale songs, and it's the main reason I play DS with the music turned off. The only song I like from it is the one that plays in the Meso. Creatures 2 has the best music from the main games, and I love it. Strangly enough, I like the music from the PS1 games the best, and I often listen to it when playing around with genetics. Today's releases aren't very musical, but they are very cute! There's one pack of Norns from Mea, which are from the same run as yesterday. The second pack is from Allekha and the Norn in it are generation 240! The last release for today is a Chocolate Rose patch plant from Kezune and TrellyDawn! A pack of tough, old Norns from Mea! A pack of Wolflings from Allekha! Some yummy Chocolate Roses from TrellyDawn and Kezune! Everyone give another hand to Rascii for fixing the site, and to the community in general! The CCSF has been going on for 10 years now, and that's no small thing. The community has survived major sites closing down and Ettins stealing everyone's gadgets for years. There is wiki pages being updated, new breeds being made, new metarooms and worlds being made, and new people joining the community. It just goes to show that everyone here has hand in making this a truly amazing community! Today's releases are also really amazing, like always! There is a colorful pack of Norns from Mea. She also has a nice thank you picture for Rascii and anyone who helped him fix the site! There's the agent that inspired today's little theme, the Hands Off agent from Kezune! A "Great Big Thank You" picture from Mea! A pack of Norns from Mea! The Hands Off agent from Kezune! Guess what's been fixed? The site! A huge thank you goes to everyone for waiting patiently, to Rascii, and everyone who helped him find the bugs. Without your patience and help finding the bugs, the site would still be a mess and the CCSF would still be delayed. As most of you know, the Creatures Caves host switched from PHP 4 to PHP 5 and this broke most of the site. Uploading agents or adoptions was impossible and I couldn't come up with a decent alternative. So the CCSF was put on hiatus until the site was fixed. The majority of the site is back to normal, and the CCSF can continue! Since the holiday season is so close, I couldn't help but change a few things. The rest of this year's CCSF will run from December 1-12th. So that means there will be 15 days to this years CCSF, instead of the 14 that I origionally had planned. The rest of the days will have a "12 Days of Sheemas" theme that ties each day's release together instead of it being a random theme. The releases for each day were already grouped around a certian theme, so that hasn't changed much. The contests also haven't changed. They will still run like normal, and the dates for them have already been decided. If you're still confused, then please either post a comment on here or on the CCSF news thread! Some Ettins from Old Albia!" The CCSF was down because uploading submissions was impossible, but now it's back! The rest of the CCSF will run from December 1-12! Contests entries are now due December 10th! There will be a small "12 Days of Sheemas" theme that ties the rest of the releases together! A pack of Grendels and old Ettins from Mea! The Doge Ettins from Ylukyun! A C1toDS Metaroom Showcase written by Ylukyun! Happy Quirky Day! It's a (totally not made up holiday) that is celebrated by eating quirky cookies. It just so happens that one of today's released is a new quirky cookie pack created by Ylukyun! In case you feel like sharing your cookies, you can give savannahs11's spliced Norns a few! There's also a hungry group of Ettins from Mea who would love to help you make the new cookies. They might just steal them though. Ron's question of the day is sort of related to edible things: Which species of Ettin is named after a type of food? Like all of the questions, the answer can be found on the Wiki! The main CCSF site has been updated! The C3 Relaxed Wolfling Run starts tommorow! Maybe check out this year's contests? Some new Quirky Cookies from Ylukyun! A pack of spliced Creatures from Savannahs11! A pack of Ettins from Mea! It's day two and it's a quieter day then yesterday as far as releases go. There's still plenty of wolfling or feral runs going on in the forums though, including a new one. A new C3 wolfling run, The Relaxed Wolfling Run has been created, and it will start on November 4th! The C1 Mystery Feral Run is full and the Norn's have been revealed! The Random Event Run has also been streamed, check out the highlights if you haven't see them yet! 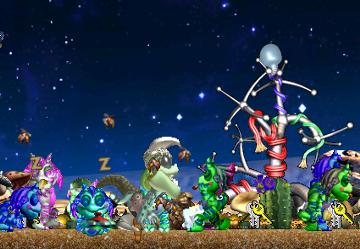 We all know that Creatures 1 takes place on Albia, but what is the name of another Creatures planet, the 3D world from Shee legends? A new wolfling run has started, The Relaxed Wolfling Run, and it starts on November 4th! The last day to submit entries for the C2 Feral Run is today! A pack of Creatures from Mea, who have Grendelish personalities! A pack of survivors from Mea, who survived a doomed feral run! Part 1 of the "Handish Wonderings" by Allekha! Welcome to this year's CCSF! This year's theme is evolution and natural selection and we've certianly followed it this year, between the sifferent releases and CCSF activities. Much like last year we have some wonderful coloring pages, which were created by Mea for the CCSF! Four forum feral/wolfling runs have also been created just in the for the CCSF. Three can still be entered, the Colortrue Ettins wolfling run and Creatures 2 Feral run. There's also two empty spots in the C1 Mystery Feral Run! If you can't get enough of Creatures events, and I know I can't, then there's also this year's contests! Which brings me to this year's mascot, who's also a part of a contest. This year's mascot is Ron, a decendant of the first Norns! Each day of the CCSF he's going to have a question for you. If you answer all 14 correctly, then you get to take him home with you at the end! Remember to not share the answers though! Today's question is an easy one, Who was the first Norn? * CCSF contests are open and accepting entries! * CCSF Random Event Run starts soon today! * C2 Feral Run will start later tonight! * A Halloween-themed Tulu showcase by razander! * A pack of spooky Zombies from Mea! * A redone Spam Norn breed by Grendel Man! * A lovely coloring book from Mea! * And finally some new eggs sprites by me!